The #1 Math Prep Testing System. Math TestBank is 100% FREE to test drive. Upgrade to unlimited access for $.99 (yes, 99 cents). Featured "What's HOT by Apple." Our authors achieved PERFECT scores! We believe Math TestBank will help you maximize your math skills. 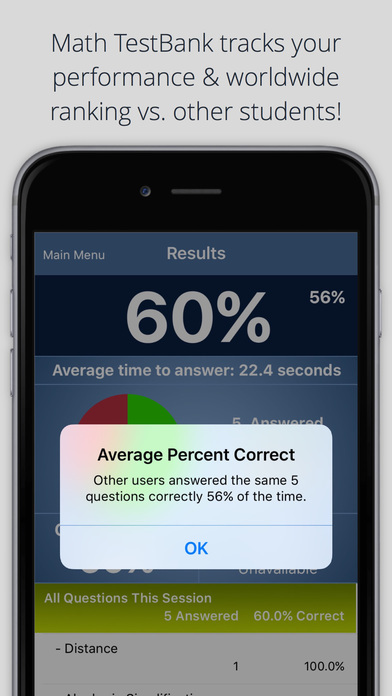 High school and college-level math, algebra, and geometry practice questions for your iPhone, iPad, and iPod touch are now in one app! 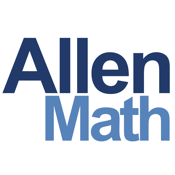 Math subjects are fully covered by our PERFECT-Score authors. We know math! Johns Hopkins provides full funding so that every student at Dunbar High School (Baltimore, Maryland) receives our TestBank Software. Subscription prices may vary by location/country. Subscriptions will be charged to your credit card through your iTunes account. Your subscription will automatically renew unless cancelled at least 24 hours before the end of the current period. You will not be able to cancel the subscription once activated. Manage your subscriptions in Account Settings after purchase. ADAPTIVE LEARNING TECHNOLOGY: Math TestBank is continually re-calibrated every time you answer a question, based on your personal performance. Explanations and rationale provided for every question. This makes Math TestBank a truly stand-alone program. Math TestBank keeps you on your toes. Become a better test taker, creating confidence in the materials learned. Your performance is displayed when you open the app, allowing you to track your progress and target your studies. Math TestBank tracks your cumulative performance, both overall and by subject area. Math TestBank knows which questions you have seen/answered the least often. When you choose this option, the questions that you have seen the least number of times will display first. Math TestBank tracks when you get a question incorrect. After using TestBank for a while, you will want to focus on the questions that you have missed most often.